Millennials are spending their money differently than older generations on things like groceries, gas, restaurants and travel, according to a new Bankrate.com report. Millennials (ages 18-36), on average, report spending significantly more than their elders in four of the six categories examined in the survey. Millennial spending on necessities like groceries and gas surpasses that of older adults. The youngest adult generation reports spending an average of $797 per month on groceries, compared to $724 for those 37 and older. And, on average, millennials spend $254 per month on gasoline, versus the $211 per month spent by those older than them. Barnebys.com, the leading online search service for arts, antiques and collectibles, is bringing iconic photography of music legends, the Rolling Stones, to art collectors and music lovers alike. Images of Mick Jagger, Keith Richards and the rest of the bandmembers, on stage and at play, are now available at reasonable prices – including rare photography of the band by the heralded celebrity photographer Terry O’Neill. McCormick & Co. Inc. announced on July 18 that it has signed a definitive agreement to acquire Reckitt Benckiser’s Food Division (RB Foods) from Reckitt Benckiser Group plc (RB) for $4.2 billion, subject to certain customary purchase price adjustments. “The acquisition of RB Foods strengthens McCormick’s flavor leadership with the addition of the iconic French’s and Frank’s RedHot brands to our portfolio, which will become our number two and number three brands, respectively,” said Lawrence E. Kurzius, chairman, president and chief executive officer. In 1982, director Steven Spielberg created movie magic with his film, E.T. The Extra-Terrestrial, the unforgettable and emotional adventure of an adorable alien lost on Earth and the lonely boy who befriends him. Winner of four Academy Awards, including best music, E.T. The Extra-Terrestrial has become a cinematic touchstone for generations of moviegoers and one of the most beloved films of all time. 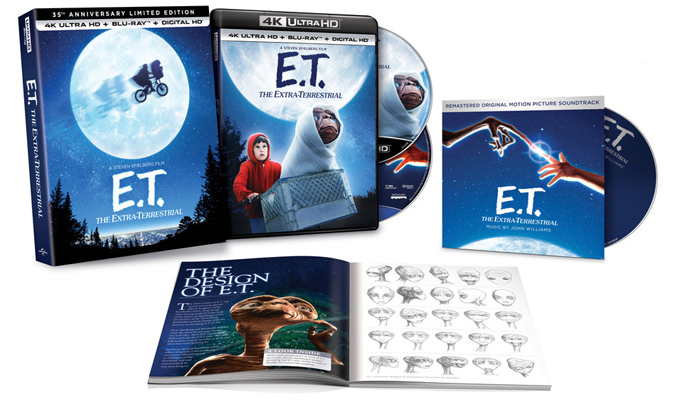 Now, Universal Pictures Home Entertainment celebrates the film’s original theatrical release with a special gift set, E.T. The Extra-Terrestrial 35th Anniversary Limited Edition on 4K Ultra HD + Blu-ray + Digital, available on Sept. 12. This gift set features premium packaging, includes a re-mastered CD soundtrack of the original Grammy Award-winning album, is packed with over three hours of bonus features, and includes a collector’s booklet with behind-the-scenes stories, and rare images from the archives.